← Simbithi Estate, Salt Rock, KZN North Coast. Sunday, 22/6/14. Sunrise reflection on the water at the river mouth. 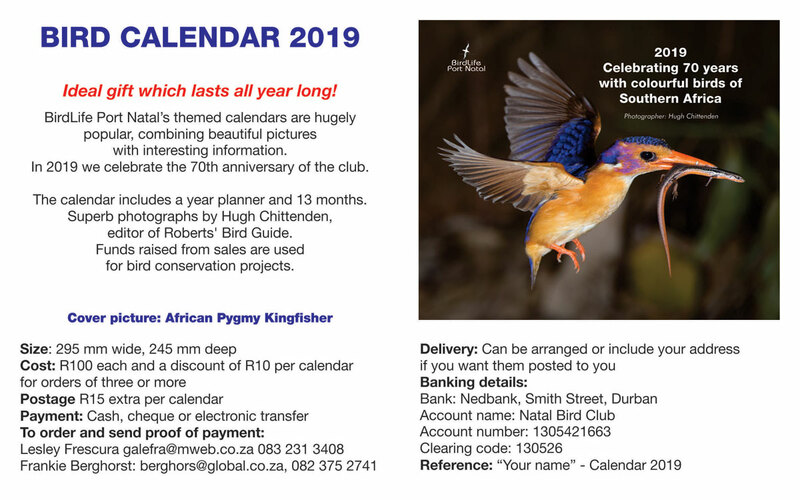 On Sunday 13th July 06h45, twenty-one intrepid birders gathered together by the Umgeni River mouth at the Green Hub – the centre of the Durban Green Corridor initiative. 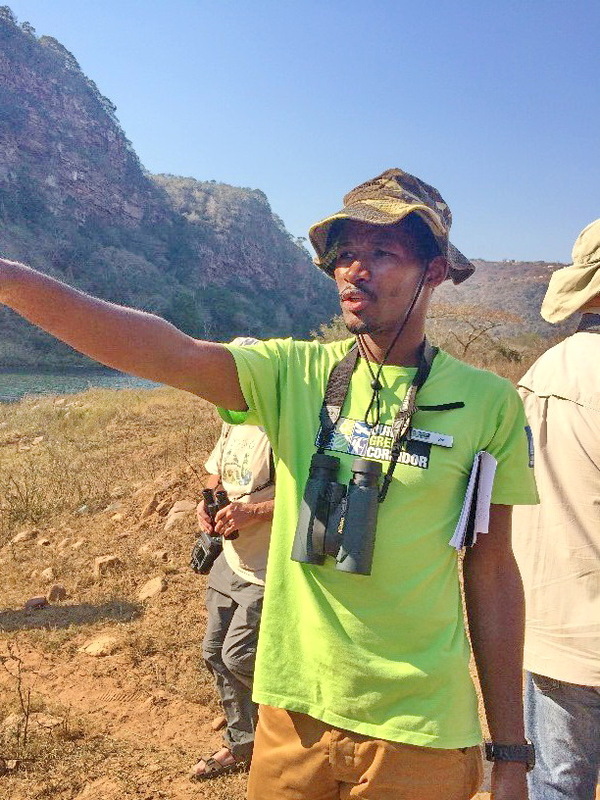 The Green Corridor initiative has created a guided tour for birders to explore the Umgeni River venturing into areas many people would be hesitant to visit on their own. This tour is known as the Finfoot Loop – why? Because the African Finfoot is regularly seen – right here in the eThekwini municipality. 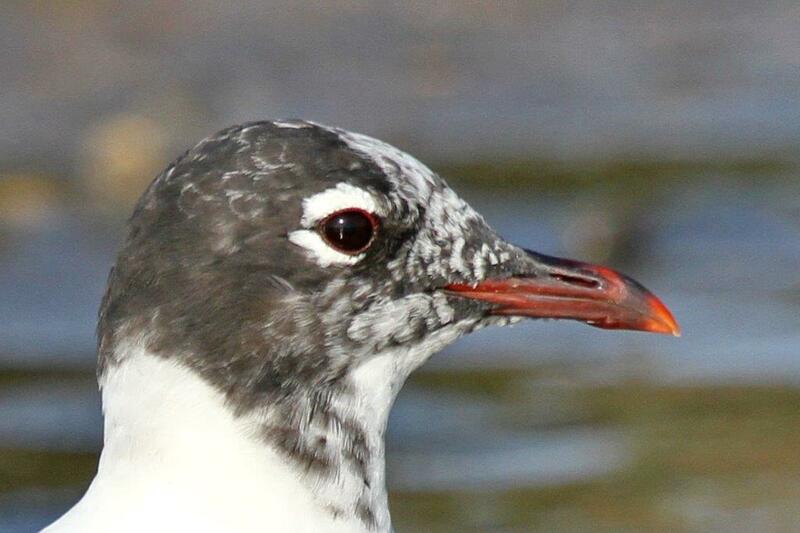 The first part of the morning was spent birding the river mouth whilst we waited for our guide. 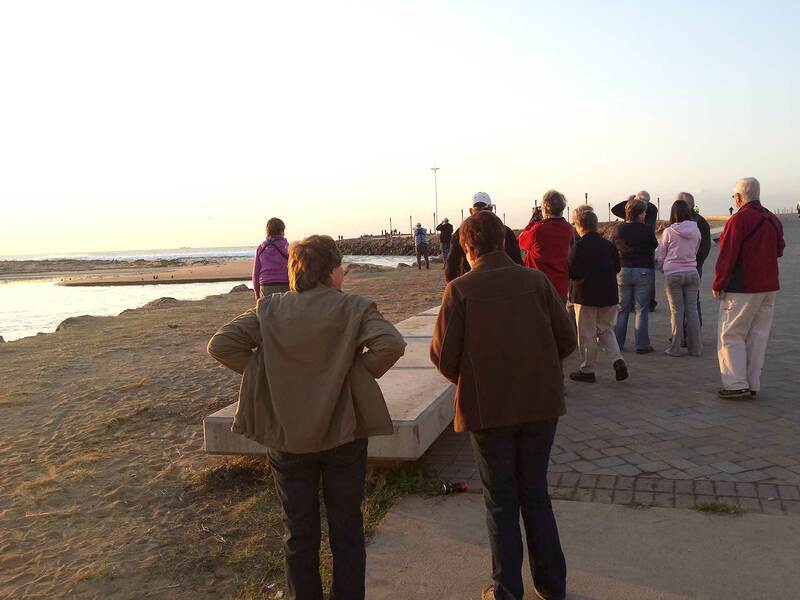 Numerous birds were seen including Cape Cormorants, Pink-backed Pelicans, Kittlitz’s and White-fronted Plovers, Grey-headed Gulls and Swift Terns as well as many other waterbirds. Even a Black Sparrowhawk sat patiently in one of the palm trees while photos were taken. Eventually, with all of us loaded into 8 vehicles, we set off. Joe – our guide – was in the lead car. Joe took us away from the metropolitan area into the Umgeni Valley following the river towards the Inanda Dam. Every so often we stopped at appropriate places to bird. Our first stop was at the large new Kwadebeka bridge over the river on the M25. We had views up and down river from up on high; after which we drove down to a place below the bridge and spent some time birding up close to the river. Here we saw a female Klaas’s Cuckoo, a lifer for some, and both Mountain and Pied Wagtails hopping amongst the rocks. Mocking Cliff-chats abounded in this particular spot as two Giant Kingfishers flew up and down the river. As we were leaving, we saw a Purple-banded Sunbird. He wasn’t visiting was he? Some of the bridges gave us good opportunities to make sure we knew the difference between Rock Martins and Brown-throated Martins. We were a little surprised to see African Palm Swift too, in the absence of any palm trees. In all we stopped at 7 different locations along the river to bird; sometimes parking on the road by the river and at other times driving off the road a short distance. The local people we met were all very friendly. The scenery is also stunning with the river running through gorges, lovely rolling hills, sheer cliffs and many indigenous trees. Of course, it was very dry being winter. Litter was bad in some areas but as we progressed further inland, it became less obvious. Crossing over a mountainous area from one stopping point to another we were treated to an aerial display of a juvenile Martial Eagle being bombed by a Lanner Falcon. It was at the last bridge crossing below the Inanda Dam wall that the African Finfoot was eventually spotted by a small number of the group. Unfortunately it was some distance away and moving upstream quite quickly and out of sight. 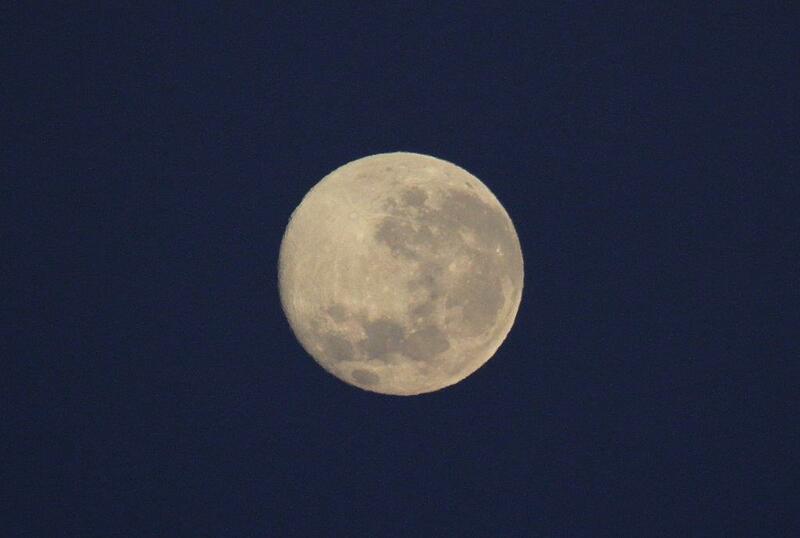 Despite many of us going to the area where it was seen, none of the rest of us spotted it. Where is the African Finfoot? 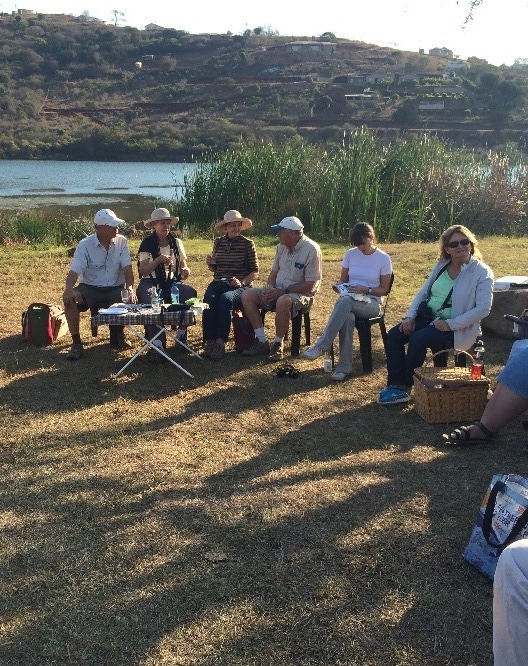 The final venue was the picnic site at eNanda Adventures on the Inanda Dam – about 4 km NE from the dam wall. We arrived about 14h00 for our picnic and braai. Tables and chairs were quickly brought out for us as well as a couple of braais. After the braai the remaining group of five vehicles crossed the same bridge where the African Finfoot was spotted earlier. As they crossed, one of the group – Geoff- spotted the Finfoot. Mad panic ensued with all the vehicles stopping on the bridge, doors being flung open, bodies tumbling out and there in all its splendour the African Finfoot calmly swam up to and onto a close-by rock for all to view. Madness erupts as the African Finfoot is spotted. The day was well organised and well guided. The birding was excellent for the time of year and over 90 different species were seen. 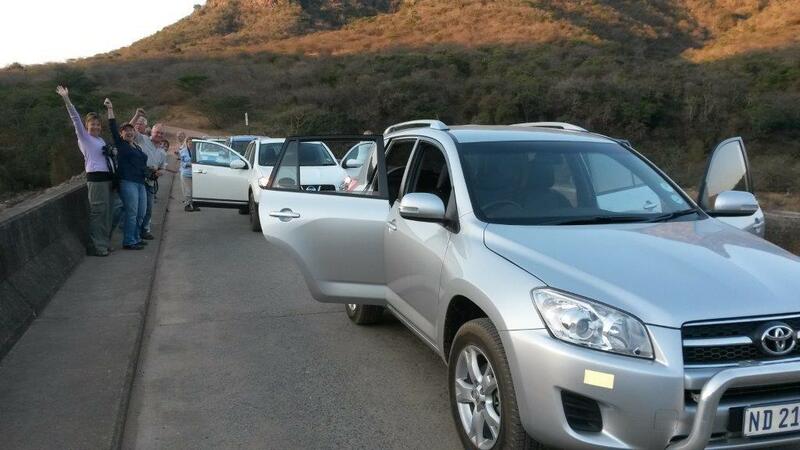 This entry was posted in Home, Posts, Reports and tagged eNanda, Finfoot Loop, Green Corridor, Green Hub, Inanda Dam. Bookmark the permalink. WHat a wonderful report of a great outing.